The new Yamaha XTO Offshore, a 425-hp 5.6-liter V-8 4-stroke. Yamaha Marine Group unveiled its most powerful outboard, the 425-hp XTO Offshore, at a media event today at its test facility in Bridgeport, Ala.
Thirty-eight journalists from 29 media outlets were on hand for the debut of the engine, which features a 5.6-liter V-8 4-stroke powerhead, a non-hydraulic integrated electrical steering system and an alternator that produces 72 amps at 1,500 rpm. Yamaha Marine Group president Ben Speciale said that as the industry continues to produce bigger outboard boats, the engines that power them must keep pace. In 2002, a 30-footer was considered a big boat. 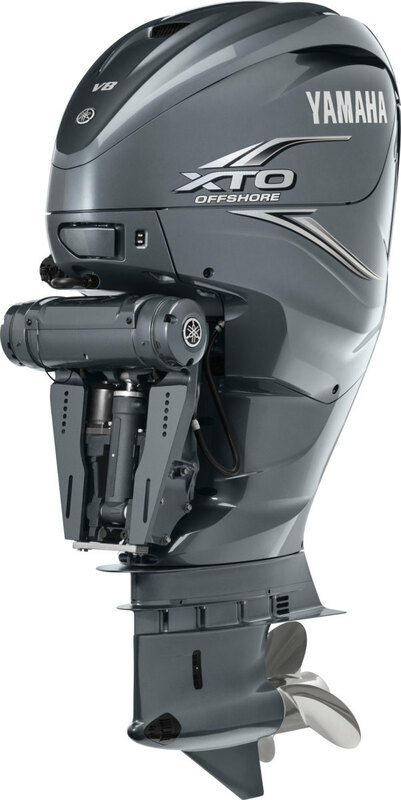 In 2007, as outboard boats reached 36 feet, Yamaha introduced its 350-hp engine. “The 350 taught us that outboard boats could get a lot bigger in this industry,” Speciale said. The XTO offshore has direct fuel injection and five fuel pumps, three electrical and two mechanical. The variable fuel pressure, which can get as high as 2,900 psi, is managed by the engine’s electronic control unit. A 12.2-to-1 compression ratio is the highest among current outboards, and Yamaha says it’s enabled by the cooling effects of the direct injection. The spark plugs are iridium, and the engine runs on 89 octane fuel. Yamaha uses plasma fusion liners in the cylinders, rather than steel. The material is thinner, lighter and harder than steel, which should contribute to increased displacement without increasing powerhead size. To ensure that the outboard runs at proper temperatures, it has two thermostats per cylinder bank. One pair helps regulate engine temperature, and the other two maintain oil temperature. For durability, dual overhead camshafts on each cylinder bank are connected by means of a self-tensioning chain immersed in an oil bath. Single-sprocket belt engagement allows for a narrower, more compact profile. Bucket-type valve lifters eliminate the need for shims and are carbon-coated for reduced friction. A dual-chamber oil pump ensures proper lubrication. For exhaust, the intake tracks enter the cylinder head from both sides of the powerhead, giving the gases a more direct route to the lower unit for improved flow. Additionally, the exhaust outlets on the gearcase are positioned above the propeller, which Yamaha says gives the engine a 300 percent increase in reverse thrust over its 350-hp engine because the prop gets a harder bite in clean water. The lower unit is designed with a two-stage water pump that has a large rubber impeller and a steel impeller to keep cooling water flowing through the engine, which is available in 25-, 30- and 35-inch shaft lengths and fresh- and saltwater models. The XTO Offshore’s integrated non-hydraulic steering uses an electric motor and a control unit that communicates with Yamaha’s Helm Master system, which has been upgraded with new software for the engine and an updated CL7 display with a 7-inch screen. For easier servicing, the XTO Offshore’s lower-unit gear lube can be changed with the boat in the water, and the engine can be tilted higher on the transom than the Yamaha 350. The rigging tube is 25 percent larger than on previous models and offers 3.25 inches more clearance at the outboard well when tilted up. Upper mounts are placed wide on the upper midsection and are used in conjunction with the manufacturer’s long span mounting system. A dual system provides two methods for flushing the outboard: one routed through the rigging tube and a conventional front-mounted hose connection. Yamaha says a multipiece cowling allows easier access to the powerhead and midsection. The XTO Offshore is available in white, gray or unpainted, and it comes with a five-year warranty.